At the southern tip of the Baja California Peninsula, in Mexico, you’ll find the tiny, thriving party town of Cabo San Lucas. It’s a must-visit destination on any cruise along the Pacific Coast thanks to its incredible beaches, outdoor adventure, tasty food, and famed nightlife. 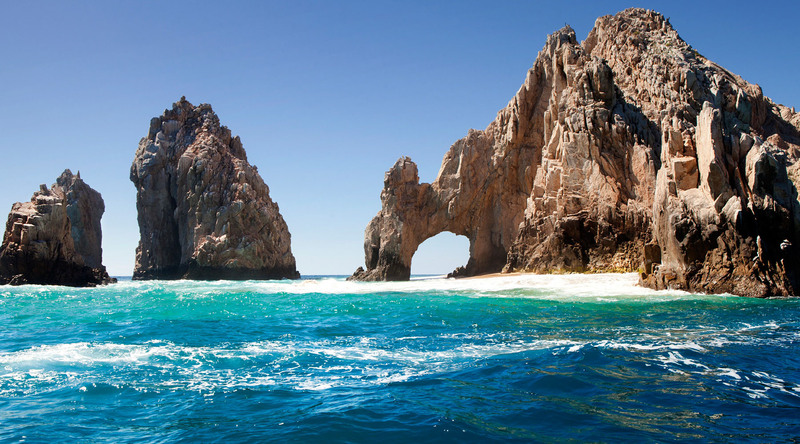 Here’s a quick guide to the best things to do while you’re in Cabo San Lucas, Mexico. The coast of Mexico’s Baja California Peninsula is dotted with spectacular beaches. One of Cabo’s most famous beaches is Playa del Amor, or Lover’s Beach. Located on at Land’s End on the Bay of Cabo San Lucas side, it’s great for swimming and snorkeling. Despite the name, this beach’s atmosphere is more “fun and bustling” than “secluded and romantic”. Just a five-minute walk from Lover’s Beach is its more treacherous companion, Divorce Beach. Located on the Pacific Ocean side of Land’s End, the waters of Playa del Divoricio suit its name: turbulent and best avoided. However, it’s more secluded and good for sunbathing. If you’re looking for the ultimate beach day during your cruise, join our Cruise Global, Relax Local shore excursion to the adults-only Breathless Beach Resort. Located on the popular Playa Medano, it’s the perfect place to enjoy fun in the sun in Cabo. Cool off with a tropical cocktail – or two! It’s an open bar. When it comes to dining in Cabo San Lucas, fresh, local seafood is king. Cabo Wabo, owned by “The Red Rocker” Sammy Hagar, is a Cabo San Lucas icon. You can visit this local watering hole and try some delicious tacos during our Cruise Global, Walk Local tour, “A Stroll Through Cabo’s Favorite Local Hangouts”. Another mainstay of Cabo San Lucas is Edith’s, near Playa Medano. The cuisine is a mix of traditional Baja California “with a Guerreran flair, featuring a regional fusion of steaks and seafood with local ingredients.” Or, head down to The Office – also owned by Edith’s – to dine right on the beach. Nick-San is one of Cabo’s most popular restaurants, thanks to the way it fuses fresh, traditional Mexican ingredients with Japanese dishes. The region is known for its tuna, so be sure to sample some while you’re there. Besides beaches and food, Cabo San Lucas is known for its nightlife. Champagne and sunset views? Sign us up. Our Cruise Global, Nights Local shore excursion in Cabo San Lucas will take guests to the Tattinger Terrace bar for a luxurious night out. Live music, fire pits, and a stunning view of El Arco set the scene for a glamorous night out. Slim’s Elbow Room is one of a few places in the world that lay claim to the world’s smallest bar. Serving just beer and tequila, it’s perfect for a casual night on the town. This library-themed bar at the Breathless Cabo San Lucas Resort offers more than 150 agave spirits on its menu. If lounging on the beach isn’t your cup of tea, that’s OK. There’s plenty else to do in Cabo San Lucas. Cabo San Lucas is an ideal destination for whale watching. You might see humpback, gray, sperm, minke, and even blue whales during an outing. Our Cruise Global, Eco Local shore excursion is a great way to explore the beautiful Sea of Cortez and the peninsula’s rugged coastline. Photo via Azamara Quest Captain Jose. The waters surrounding Cabo San Lucas are also great for diving and snorkeling. In fact, Jacques Cousteau once famously called the Sea of Cortez “the aquarium of the world”. For the best snorkeling experience, head offshore. During this luxury yacht shore excursion, you’ll have the chance to snorkel or stand-up paddleboard. Get a true sense of Cabo’s unique, beautiful landscape during a leisurely horseback ride with our Cruise Global, Adventure Local shore excursion. From the lapping waters of the Pacific Ocean to the vast sands of the Mexican desert, it’s a sight to behold. Photo via Captain Jose (pictured). With so much to see and do in Cabo San Lucas, it will be easy to fill a day in port! Luckily, when you cruise to Cabo with us, you’ll get more time in port. Join us on this 17-Night holiday voyage in 2019!